Welcome to the first and only International Society for Psychotherapists, Counselors and Psychiatrists: the International Society for Psychotherapy, Counseling & Psychiatry Theories, Researches & Clinical Practices (ISPCP). Although practitioners, researchers and academicians from these three disciplines are related with the vision of the provision of effective therapy for patients with psychological disorders and the promotion of good mental health, until now, there is no platform for them collaborate. Recent developments in neuroscience, neuro psychotherapy and psychiatry have provided the timely opportunity for these collaborations to take place. The ISPCP provides also a forum for the collaboration of the development of theories, researches and clinical practices for the first time in the history of psychotherapy, counseling and psychiatry. The need for collaboration in these three related professional activities have been taking place as often we see good researches that were conducted as a result of the formulation of bold theories which themselves were often formulated as a result of insights gained from clinical practices and there have been new publications such as the International Journal of Neuropsychotherapy and Neuropsychotherapy in Australia, which have started to address some these collaborations. We therefore welcome clinical practitioners, researchers and thinkers in the field of Psychotherapy, Counselling & Psychiatry to join ISPCP and contribute your dialogue as well as your work to this forum for which we publish the International Journal of Psychotherapy, Counseling & Psychiatry: Theory, Research & Clinical Practice (IJPCP); and the Handbook of Psychotherapy, Counseling & Psychiatry: Theory, Research & Clinical Practice (HPCP). 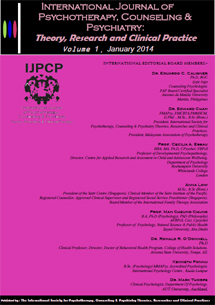 As members of ISPC you get free access to the IJPCP and the HPCP and also members discounts and access to have your work in the areas of theoretical developments and formulations, researches or/and clinical practices published in these publications and presented in ISPC conferences, symposiums and other professional forums.